Today I will give you a recipe of making tasty traditional Kerala style parippu curry (parippu koottan / Moong dal curry). This Moong dal recipe is really an easy one to prepare one. Parippu curry can be served with Appam, Steamed rice, Thenga choru etc. Moong dal curry is an inevitable side dish in the traditional Kerala sadhya / grand feast. 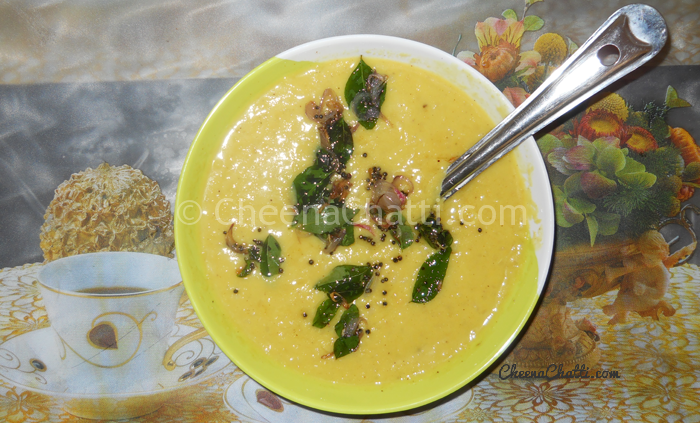 Don’t forget to let me know your comments after trying this special moong dal recipe. Pressure cook the moong dhal with half tea spoon turmeric powder until you hear three whistles. The moong dhal should be completely sank in water. Make a fine paste of 3 table spoon of grinded coconut, 1 clove garlic, 1/2 of a green chilly, 1/4 tsp turmeric powder in a mixer. Add the #2 mix to the moong dhal. Add salt and additional water if needed. In a pan add oil, mustard seeds, finely chopped onion shallots (kochulli) , 1 to 2 green chillies sliced length vise, 2 red chillies, curry leaves and saute till it become golden brown. Adding a little ghee to the top of curry will make it more tastier. Some people even fry the moong dal before using. I haven’t tried it that way. Do you need more dal recipes? This entry was added on March 18th, 2013 by Reeja MytheenKunju in Vegan and tagged with kerala parippu curry, parippu curry, parippu curry recipe, dal, kerala style parippu curry, curry, kerala curry recipe, kerala curry, moong dhal curry recipe. Last revised on April 4th, 2018. My favourite dal recipe. So simple but yet such a complex earthy flavour. Thank you!